Chatoyer Environmental’s custom sized Silt Wardens were installed to provide protection of stormwater pits during construction. Silt migration was identified as an environmental risk while widening a motorway. The Silt Warden was placed in the existing stormwater pits within the median strip to prevent silt from escaping into the stormwater system. The Silt Warden was chosen as the best option to safe guard the stormwater network, add value for money and create an easily managed stormwater quality control plan. A 21km stretch of the M5 South-West Motorway was being widened to three lanes. After consultation with the customer, three custom sized variations of Silt Warden were manufactured to fit the existing stormwater pits. 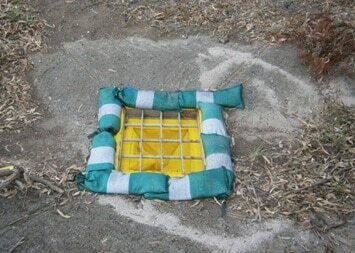 Simple and easy to use, retro-fitted silt trap. 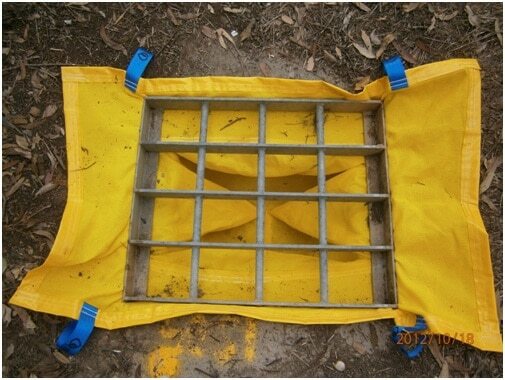 Heavy duty design for construction site use and large volumes of trapped silt. UV Stabilised, reinforced horticultural cloth. PVC edged with four webbing loops for easy removal and maintenance.